Molting in budgerigars -- or budgies -- is usually a totally expected and healthy pattern, one in which the birds' old feathers fall out only for others to grow in fresh and new. Complications can sometimes occur, however. Some budgie youngsters, for example, can get an ailment known as French molt that can actually prevent them from flying for good. If your budgie is undergoing a typical molt, you might notice his feathers dropping out gradually, with new ones popping up as successors relatively quickly. Apart from his feathers' simply dropping, you might also observe him being a bit less lively than normal, with more time spent sleeping. Throughout all of this, budgies usually manage to retain their normal flying abilities. Since molting can be so physically taxing, it isn't uncommon for budgies to be rather grouchy mid-molt. Time isn't usually a reliable indication of standard molting in the budgie world. Budgies differ from many of their fellow birds in that they don't usually molt according to predictable schedules. Note that these birds, on the whole, are capable of molting at any time. Because of that, it's not realistic to consider the time of the year when trying to determine whether your budgie is indeed molting. Wee budgies often experience their initial molts when they're around 10 to 12 weeks of age. French molt is an extremely common health condition in budgies, to the point that one of its names directly references them: The ailment is also called "budgerigar fledgling disease." 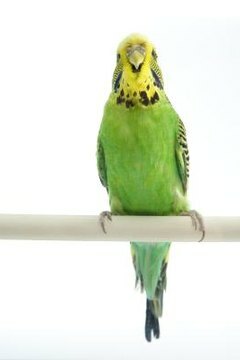 French molt often shows up in young budgies. It frequently involves their tail and flight feathers' dropping out, right when the little ones are on the verge of departing from their parents' nests. Affected birds are often permanently unable to fly, though in most cases the disorder isn't life-threatening. The root trigger for the condition isn't certain, but, as one of the suspected causes is viral infection, it may be contagious. Apart from French molt, other issues in molting are always possibilities. Always pay close attention to your budgie during molting. Be alert to any clues of molting problems, such as conspicuous areas without any feathers. It's also important for feathers to reappear promptly -- within about five to 10 weeks. A wide array of things can be potential triggers for troubles with molting, including stress, excessively cold or hot temperatures, and abrupt weather transitions. Various health conditions can also sometimes lead to problematic molting, including thyroid woes. Schedule an appointment with an avian veterinarian if your bird's molting isn't going smoothly. How Do You Tell the Difference Between Plucking & Grooming in a Parrot?